Prix de l'Arc de Triomphe winner Treve suffered the first defeat of her career when she was beaten by Cirrus Des Aigles in the Prix Ganay at Longchamp. The odds-on favourite led briefly in the final furlong before Cirrus Des Aigles got up in the final strides. Treve, ridden by Frankie Dettori, had won all five previous starts. 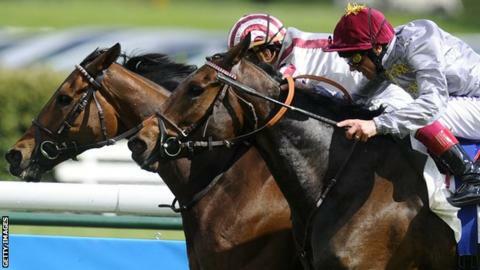 Eight-year-old Cirrus Des Aigles, ridden by jockey Christophe Soumillon, was previously rated the top racehorse in the world. Cirrus Des Aigles may now head for the Coronation Cup at Epsom on 7 June, Derby Day, and a possible clash with last year's Derby winner Ruler Of The World.